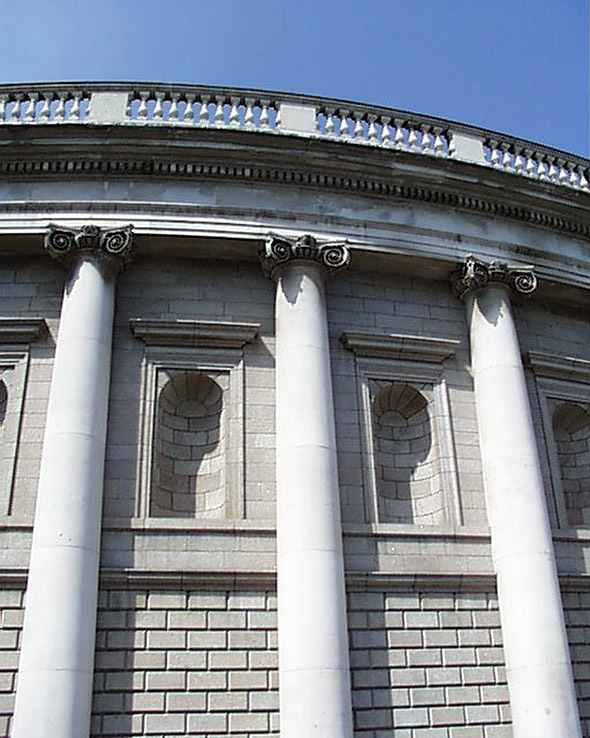 This was the first purpose built Parliament House in the world and was constructed at a great time of public confidence in Dublin. 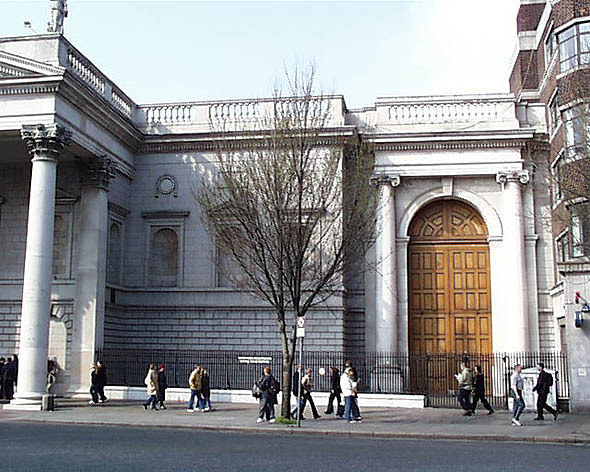 The original building designed by Edward Pearce was constructed between 1729 and 1739 is only part of the existing structure. This consisted of the central section with its huge colonnades. Pearce was actually knighted in the building on the 10 March 1731. 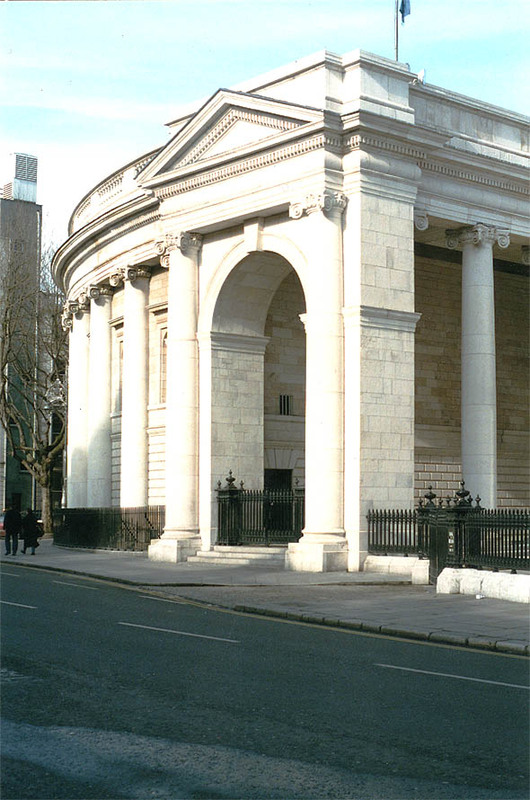 The east portico, the entrance to the House of Lords was added by James Gandon between 1785 and 1787. 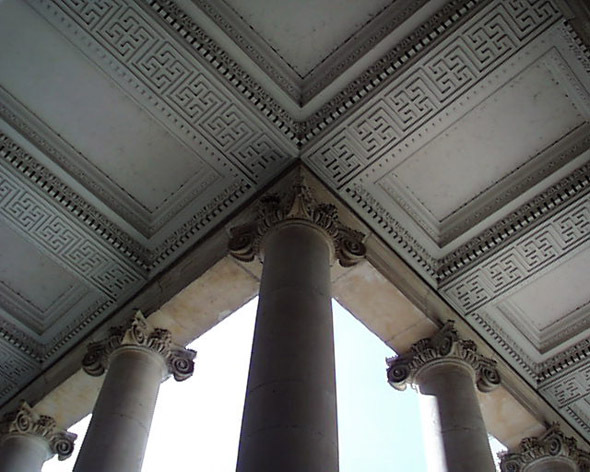 It was connected to Pearce’s work by a giant curved screen wall – which at this time lacked the Ionic columns but had the blank niches. 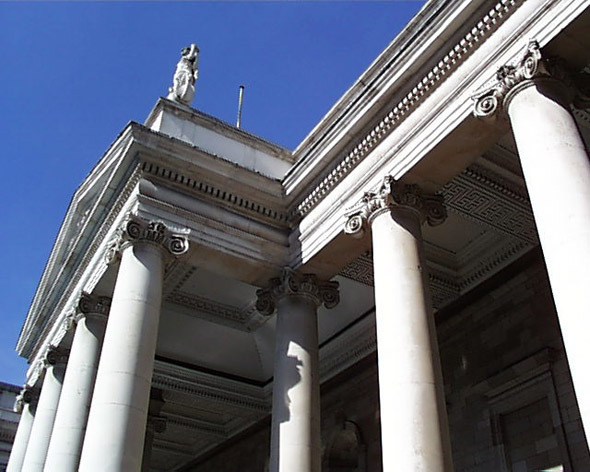 Like other buildings in Dublin notably the Custom House, the Bank of Ireland is graced by sculptures by Edward Smyth. 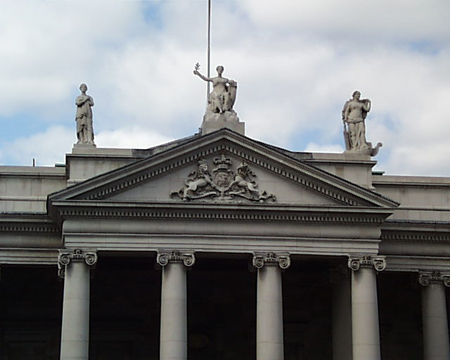 These statues are placed over the portico to the House of Lords and symbolise Wisdom, Justice and Liberty. 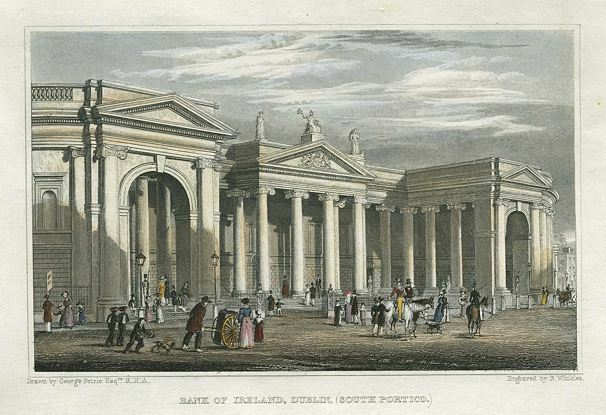 The western entrance into Foster Place was designed in 1787 by Robert Parke. 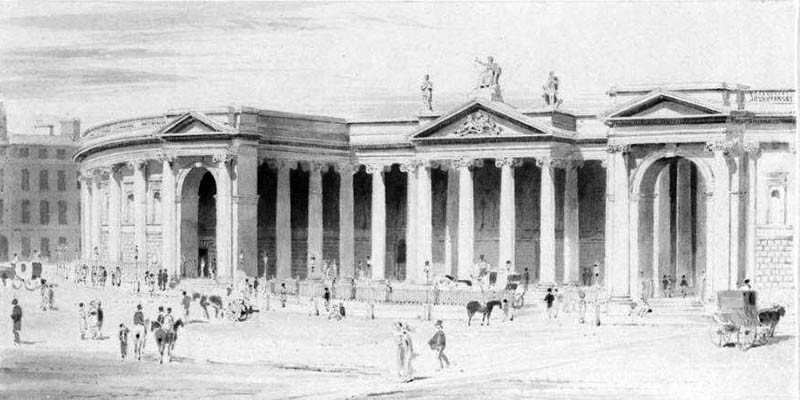 He approached the problem of connecting to Pearce’s work in a different way to Gandon, creating a curved colonnade of columns. 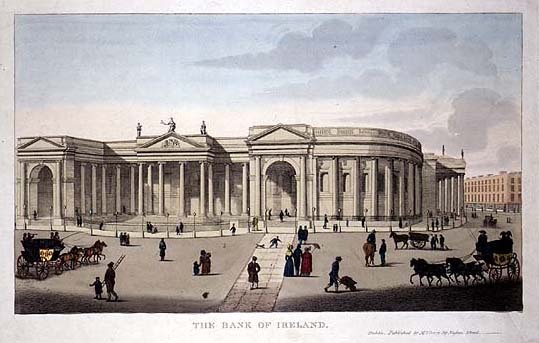 The result proved unpopular and when the Bank of Ireland took over the building in 1803, it hired Francis Johnston to convert the building. 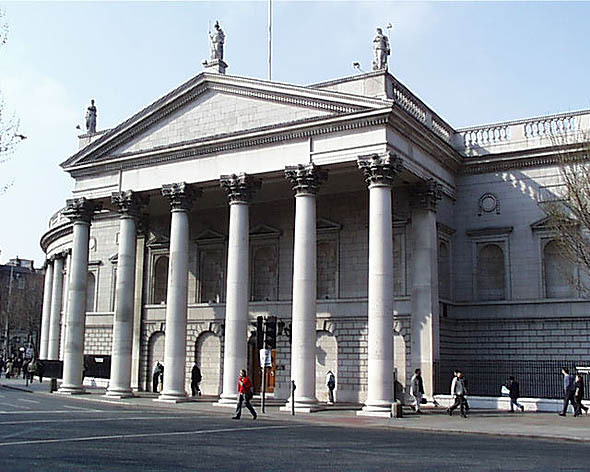 He replaced this western set of Ionic columns with a curved wall similar to that built on the east side by Gandon. 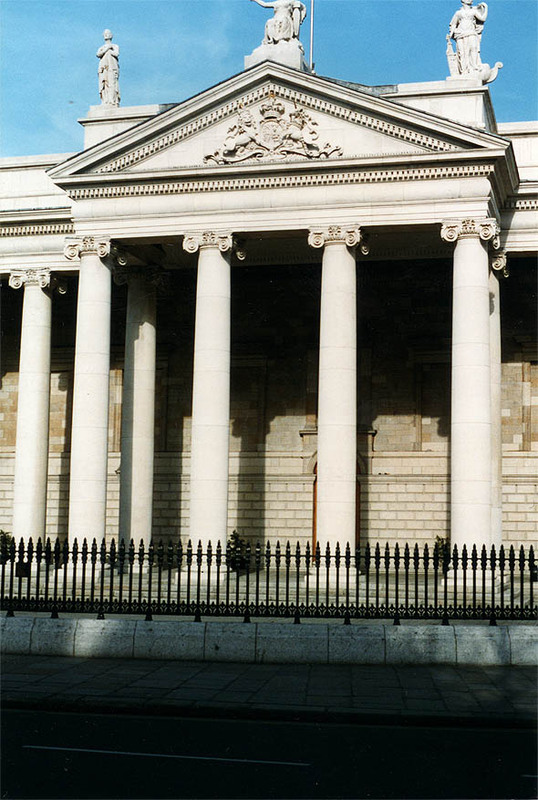 Ionic columns were then added to both curved walls, giving the extensions the final appearance that it has today. 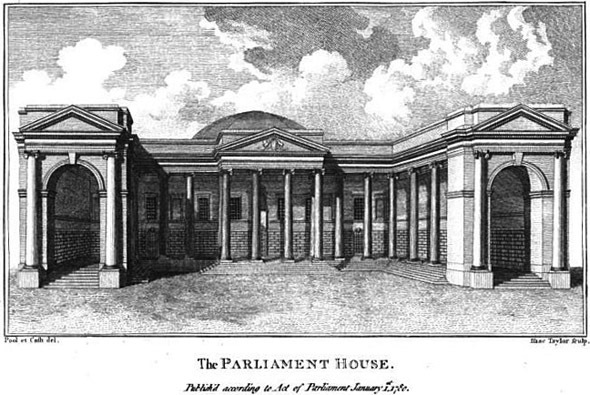 The Parliament of the eighteenth century was largely controlled by the wealthy ascendancy. On the 2nd August 1800 the parliament was persuaded to vote itself out of existence through the Act of Union. 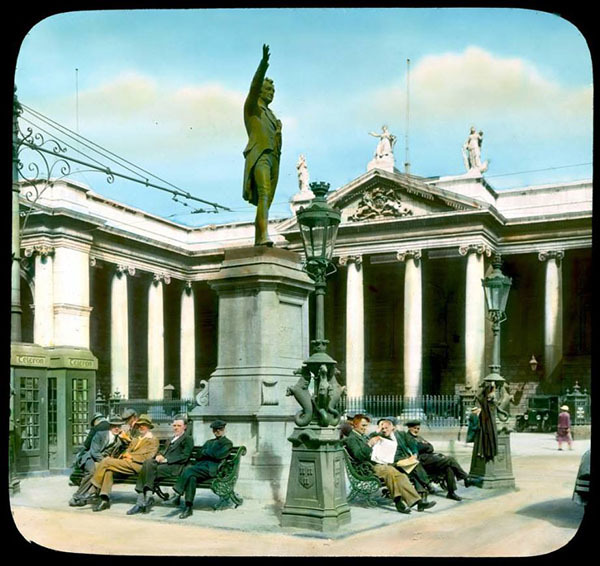 Many wealthy landlords and members of the Irish aristocracy were persuaded by promises of titles and honours from London. 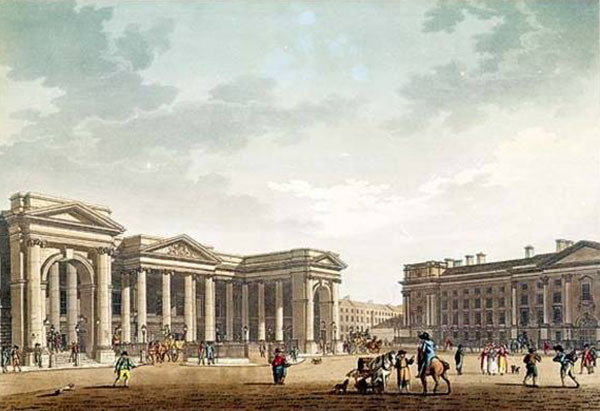 With the Act of Union the centre of power shifted to London and with it the desire for improvements to Dublin as many of the ascendancy moved to London when not living on their country estates. 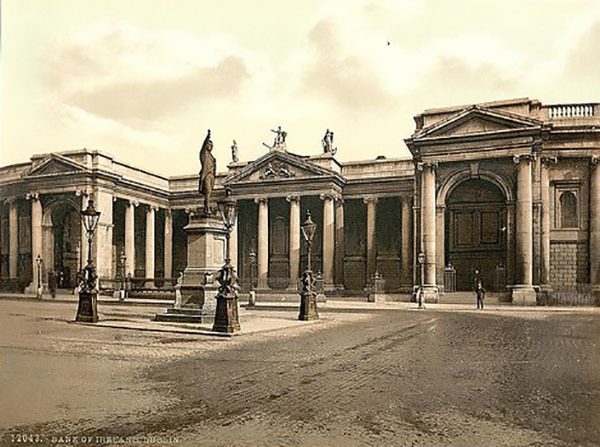 After this, Dublin began its slow slide into disrepair with the famous Gardiner Estate going bankrupt and the decay of many of the glorious Georgian streets as the houses were split up into tenements. 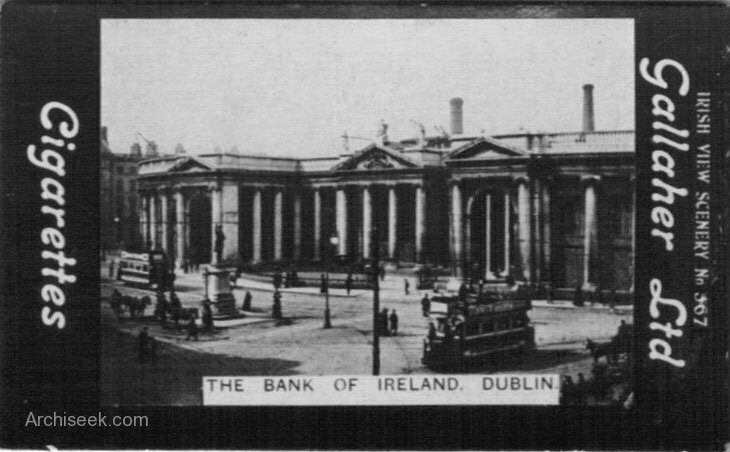 The Parliament building was sold to the Bank of Ireland under the condition that it should not be used for political assemblies. 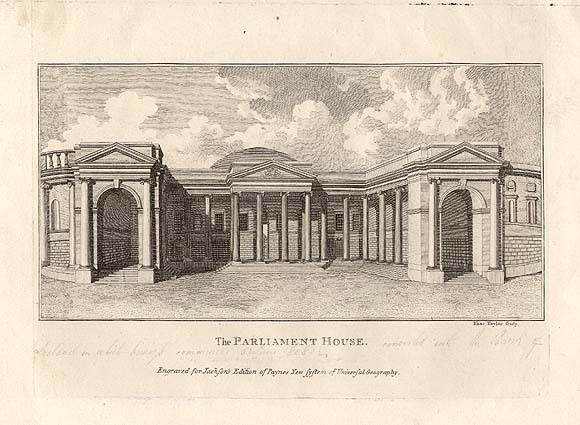 The Parliament consisted of two houses, the House of Commons and the House of Lords. The Commons is now the banking hall while the Lords remains intact. The interiors designed by Pearce exist intact except for the original Commons which was destroyed by a fire. The most important interior in the building was the House of Commons. 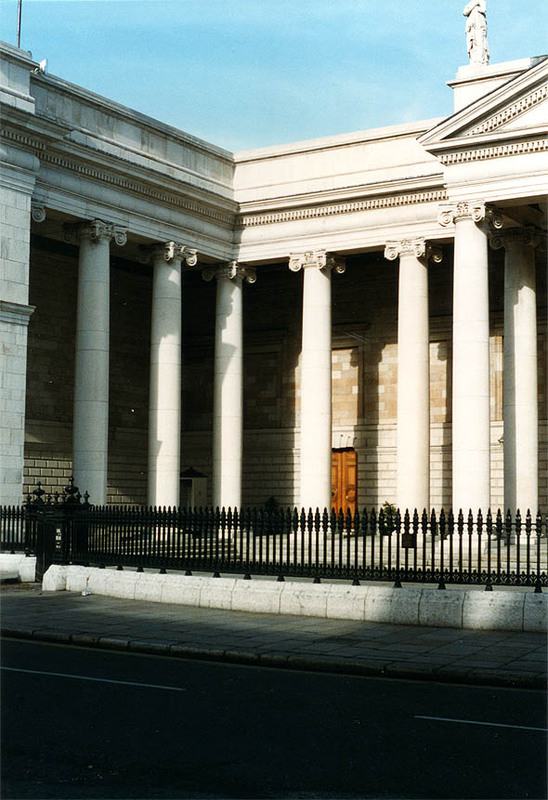 Originally it was accessed via a doorway under the central portico through two ante chambers. 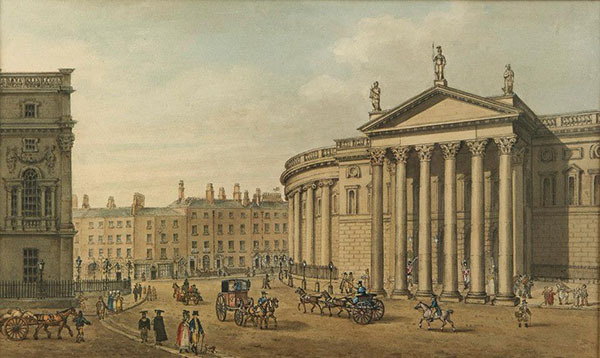 Pearce’s design (shown in a contemporary painting of Grattan’s Parliament) was octagonal with both a parliamentary chamber and a visitor’s gallery delineated by a arcade of columns. 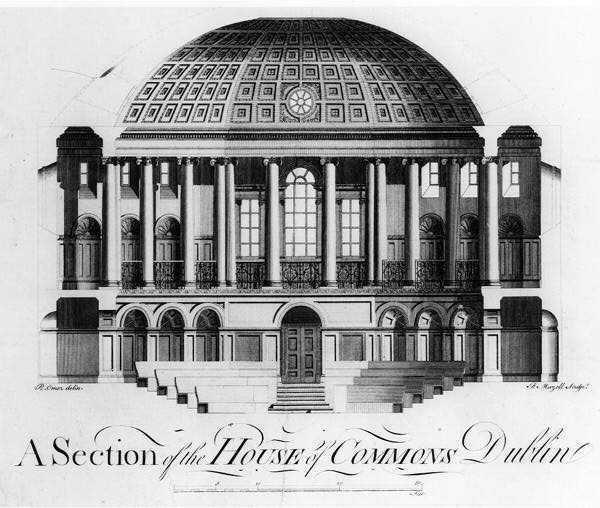 The entire assembly by surmounted by a coffered pantheon like dome. 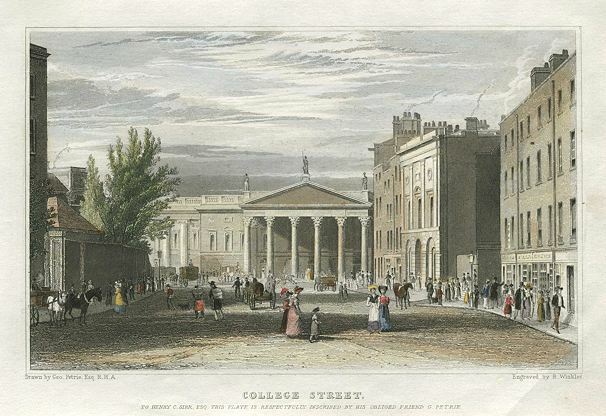 Sadly this was all destroyed by fire in 1792. 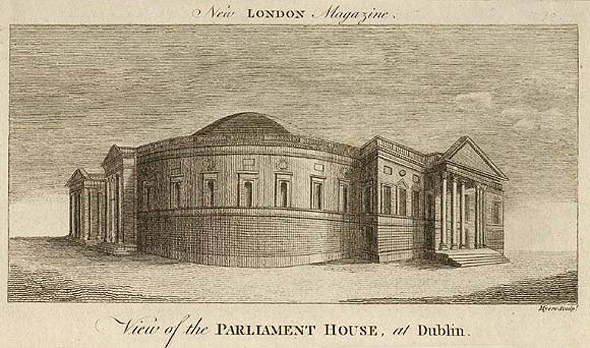 A less elaborate new chamber, without a dome, was rebuilt in the same location and opened in 1796, four years before the Parliament’s ultimate abolition. 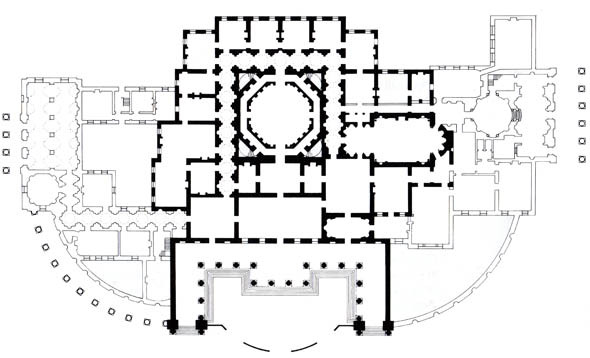 The House of Lord occupied a less important position within the plan, off the main axis to the left. This however survives and is open to the public. 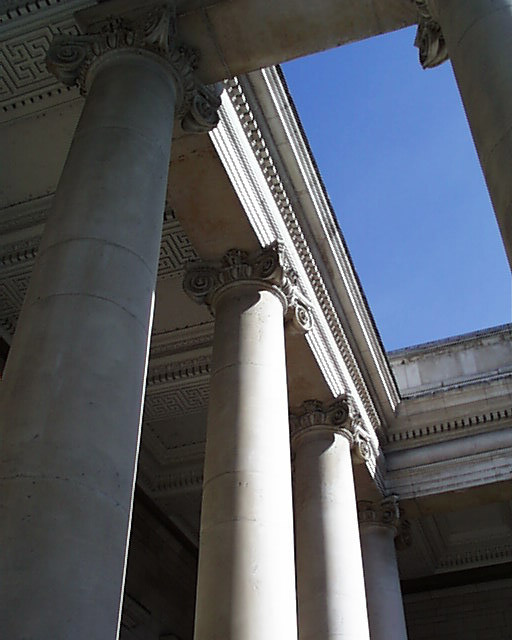 It is accessed from Gandon’s great portico to the east through a processional series of rooms and corridors. The corridors which wind around the original site of the House of Commons are lit with small top lit domes. 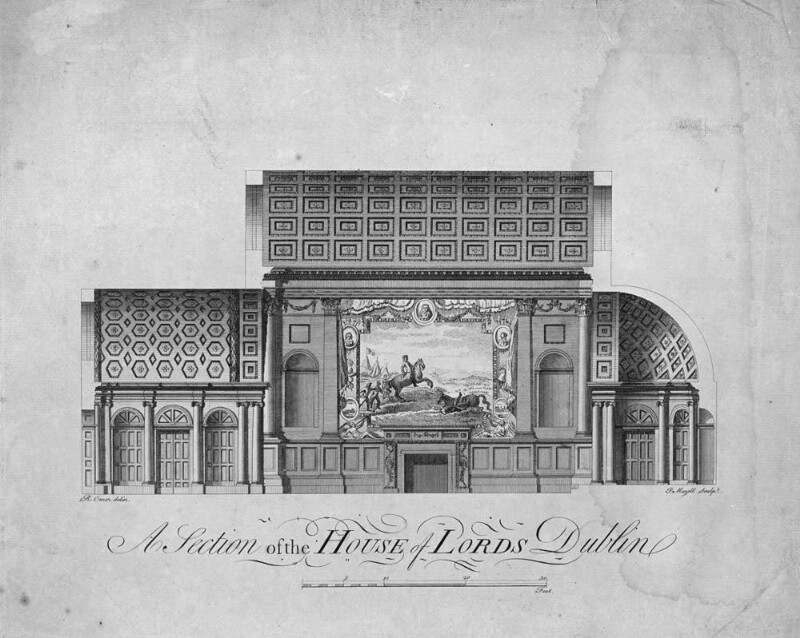 A similar device is used to light the corridors of the State Rooms of Dublin Castle which were also designed by Pearce. 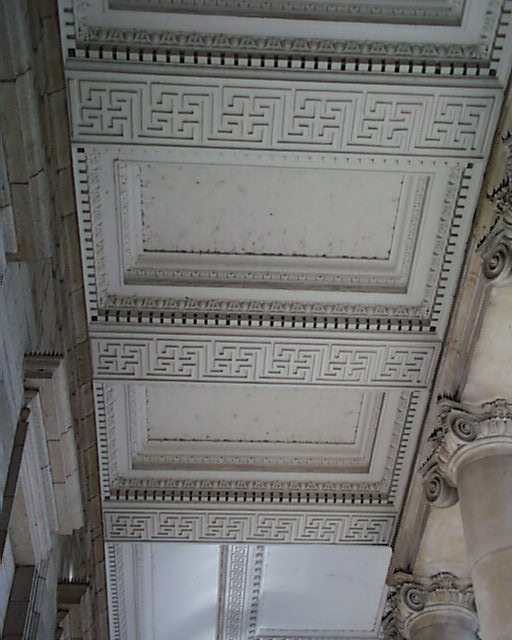 The most immediate impression in the House of Lords is of the coffered ceiling and oak panelling. Two tapestries by John van Beaver depict the Battle of the Boyne. 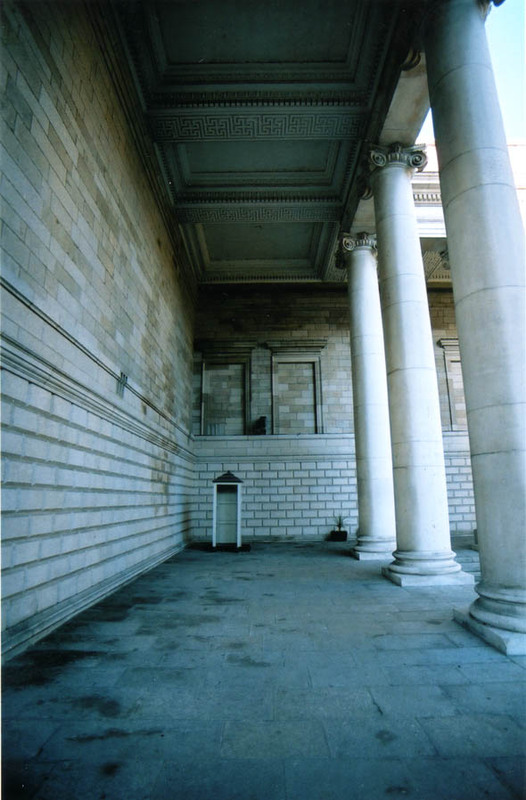 The remainder of the interior all date from the reconstruction into a Bank by Francis Johnston.